This definitely wasn't what Dr. Sij Hemal was expecting when he booked a flight with Air France from India to the United States. Hemal was tired. The second-year urology resident at Cleveland Clinic's Glickman Urological and Kidney Institute had spent his entire day traveling. He started in New Delhi, stopped in Paris and was now headed to New York, where he would catch a connecting flight to Cleveland -- his final destination. He needed a nap. The 27-year-old had planned to watch the movie "Side Effects," enjoy a glass of champagne and fall asleep. But before he could have that drink, everything changed. A flight attendant was looking for any doctors on board. So Hemal got out of his seat and went to offer what help he could. It was then he discovered that 41-year-old Toyin Ogundipe had gone into labor as the plane skirted the southern coast of Greenland, 35,000 feet below. "She was complaining of back pain," Hemal told CNN. "At first, I thought it might be kidney stones, but after she told me she was pregnant, I knew she was going into labor." 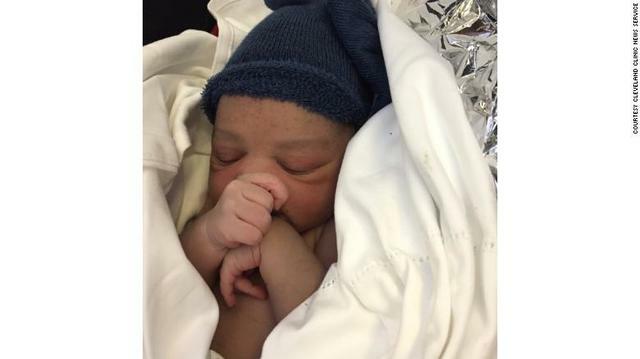 Toyin Ogundipe went into labor and gave birth to a healthy son while flying from Paris to New York. Over the course of an hour, Ogundipe's contractions accelerated. "Once they got to two minutes apart, that's when we knew we were going to deliver on the plane," Hemal said. An emergency landing would have required a two-hour diversion to a US military base in the Azores Islands. Instead, the crew moved Ogundipe to first class, which had fewer passengers and more space. They continued to head for JFK International Airport, a full four hours away. While Hemal practices urology, this wasn't his first delivery. Thanks to his training at Wake Forest School of Medicine, Hemal had delivered seven babies -- just not on the floor of a jet. "I was relaxed because I knew I was in safe hands," Ogundipe said in a statement. "They did everything a doctor or midwife would have done if I was in the labor room in the hospital. Even better, if you ask me." After about half an hour, Ogundipe gave birth to a boy named Jake. And Hemal was relieved. Jake was born on December 17 while aboard an international flight. When they finally landed, Ogundipe and Jake were quickly sent off to Jamaica Hospital Medical Center, four miles from the airport, and were released later that day. "Honestly, it was something from God," Hemal said of the mid-December delivery. "A lot of things could have gone wrong. But we made the best with what we had." Hemal still had one last obstacle in front of him -- getting to his connecting flight on time. With the help of airport officials, he made it through immigration and arrived at his gate in time. It was an uneventful flight back to Cleveland. "I'm glad I didn't have anything happen after that," Hemal said. 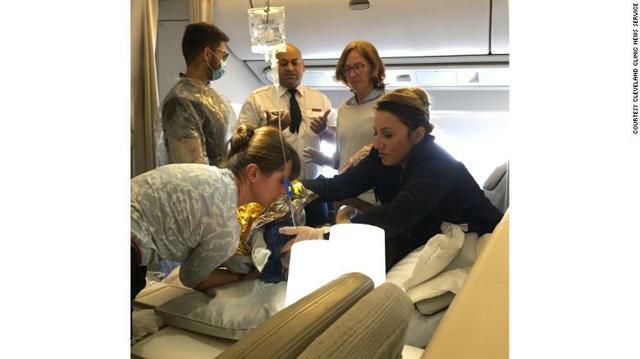 Air France even made up for that missed glass of champagne -- the airline provided Hemal with a whole bottle -- along with a travel voucher as a thank you for his medical services.